Your home for four seasons of fun! They're always biting on Lake Namakagon! Fishing licenses, live bait and boat rentals too! Who doesn't love a dip in the pool? The Best Little Resort in Northern! 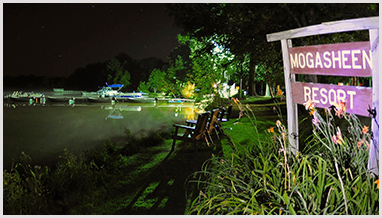 Mogasheen Resort is a Traditional Wisconsin Year-Round Resort. Whether you are a large or small group, honeymooner or retired couple, or a young active family, you will find activities for everyone, including your pet and cottages that are clean, cozy and both well-maintained and well-equipped. 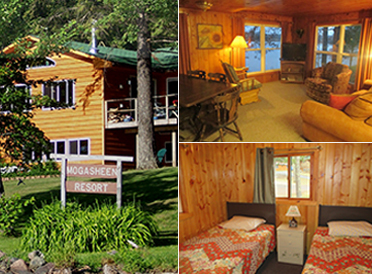 This resort in Northern Wisconsin offers comfortable accommodations with Lake Namakagon right outside your front door. Located in the Cable Area that is known for having the ‘best trails in the U.S’. The 850,000 acre Chequamegon-Nicolet National Forest becomes the mecca for all things trail related. Hiking, mountain bike, ATV, snowmobile, snowshoe and cross country ski trails create an intertwining trail system that is second to none. Bayfield County alone boasts 600 miles of groomed snowmobile trails, 10 X-country ski trail systems ranging for beginner to expert, 300 miles of marked and mapped bike routes maintained by CAMBA, 180 miles of designated ATV trails and numerous incredible hiking trails. swimming pool, sauna and game room. In addition, a public guest area with fireplace, TV and WiFi for those that love the social networking ambiance. Vacation & Stay at the Best Little Resort in Northern Wisconsin! Mogasheen Resort shared Cable Area Chamber of Commerce's video. You haven't really snowmobiled until you've ridden the trails in the Cable Area!! Mogasheen Resort added 4 new photos. Therese Gallagher SmileyWish you could of enjoyed our Iowa group!! Carol HeglandWish we were there! Sue WredlingGreat video and beautiful scenery! Kimberly Bush MehringBeautiful scenery and looks like so much fun!! Suzie Thompsonawesome, I love it! reminds me of the good old days when I was young! Thank you Sam! Dave WrightMerry Christmas to all at Mogasheen.!! Darlene FromeWe have about half a inch! Kathy Neubauer SchwennekerMerry Christmas to you all! Lynn Rieckhoff LindellA fit 'n trim Snowman! Amy OlsonMerry Christmas from the Olson's. Mary Stasik PetersMerry Christmas, from the Peters!!! Georgia SchaverWe are having a wet Green Christmas down here. LOL Nerry Christmas Patsy & Henry. Kathy Petersen KuhnenI'm jealous! (Of the snow not the squirrel!) Merry Christmas! Anne WalkowskiI'm dreaming of a white Christmas.....no chance for that this year! Anne FrameBeautiful. Sam will be happy!! Mandy RahnSend some down to us!!!!!!! 50's here today! More like Easter weather! Merry Christmas! Carol HeglandMilwaukee is have a green/brown/rainy/ foggy Christmas. Do enjoy your beautiful snow! Darlene FromeMerry Christmas to you Henry and families.We're thinking about mowing the lawn tomorrow morning so it look's nice for Christmas!! Suzie ThompsonThat's great! we're at 60° here in Oregon IL. 🙁 we need snow!!! Jon-Tiffany Sollars TurnerLove this place!! Mogasheen Resort added 3 new photos. Lynn Rieckhoff LindellWhat a project....and in FREEZING COLD WINTER! Shelly LedingWow!!! That's a big job!!! Good luck!! Betty NewpowerGo Henry! Just another day at the office! Mogasheen Resort added 5 new photos. Connie J. Voigt FoatHappy Holiday's. Patsy-Henry and Family.